One thing I will note right now is that I am not a character designer, nor am I an illustrator, or even a good 2D artist. 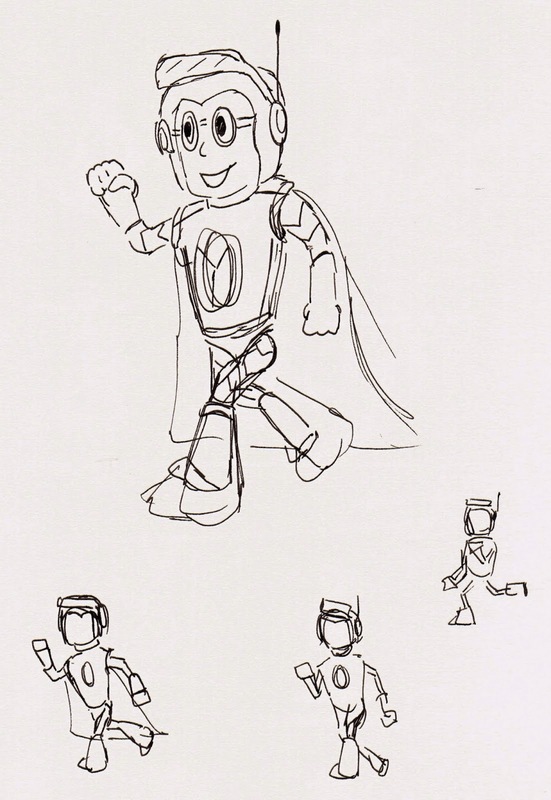 But I do love Mega Man and since the school would be pretty much happy with whatever design I gave them there was no pressure for it to be of a high professional standard. However that doesn’t mean I didn’t try to make it of a high professional standard, its just that this was something out of my expertise so I told them not to get their hopes up (wow, so optimistic). Anyway, I wanted to turn this into a little self evaluation for this blog. As its more of a mini project itself I wanted to focus on the basic illustration elements of the design. 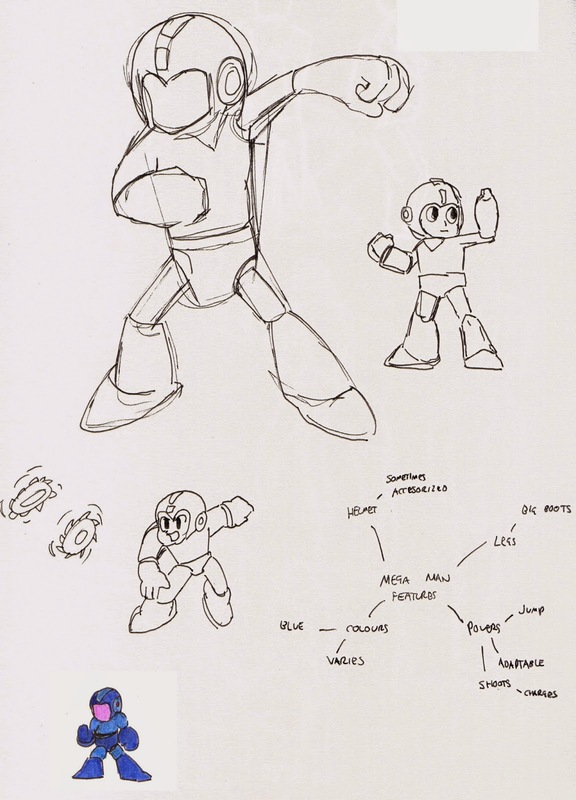 At first I did some research into Mega Man, the proportions of his body and how he is built as a character. 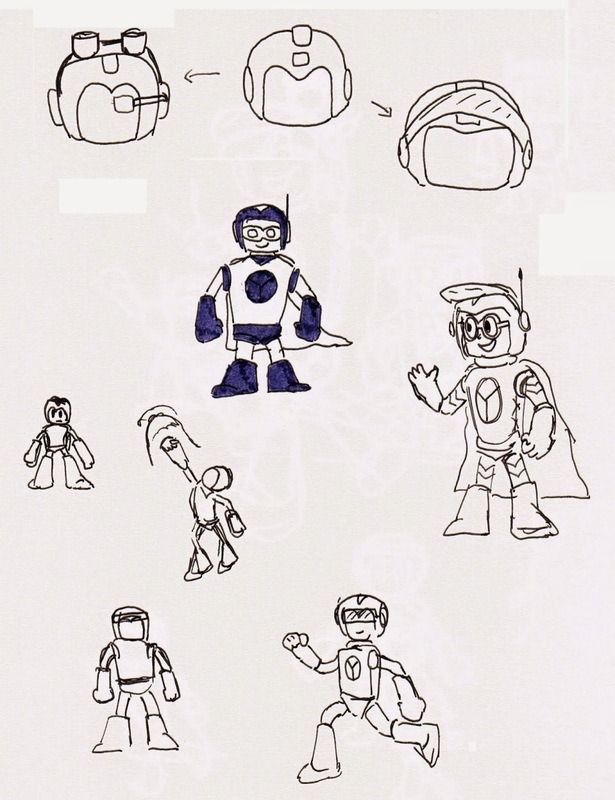 I did a few sketches of Mega Man just so I could understand why his design is good. From there I just doodled to see what I could come up with. After some feedback from the school they were happy for me to finalise a design. So as I said, I’m no character designer, but I was pretty happy with how it turned out. Sure it may be a little cliché and unoriginal but whatever, the school were happy with it. “Anti-bullying” and Mega Man were the only two things I were given to go on. Being a primary school they are also not bothered what I did with the design. 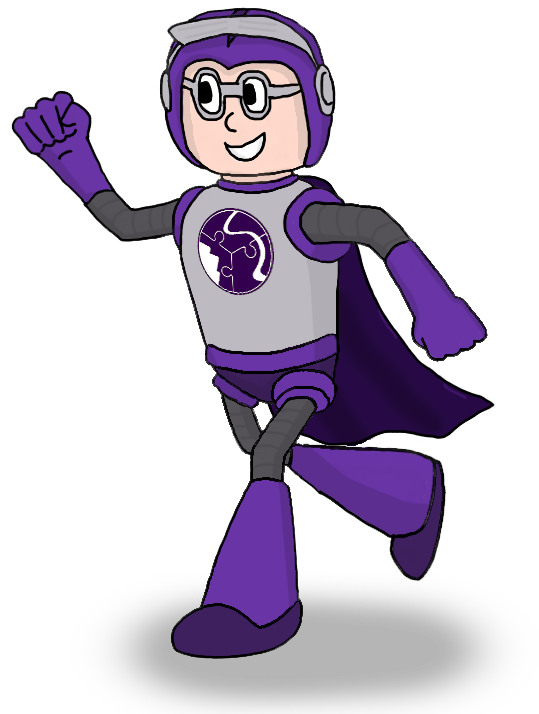 So I made sure to keep it simple, it would’ve been easy to get carried away with all sorts of robotic elements but keeping a Astroboy/Mega Man superhero look (the cape helps with that) means its easy to identify as a hero or good guy. I was happy with the design overall and for the time scale I was given (about 2 weeks in spare time amongst other work) I thought it was fine. I include this evaluation in here as although part of the design, I think it can be applied to other work if considered separately. I tried a number of different poses and angles for the character. From my visual research of Mega Man (mostly just memory) there’s a lot of action shots. This helps give the idea of superhero, action fighter type of character. I think this was where the school wanted the Mega Man influence to be in relation to anti-bullying. I originally had a stance with a simple thumbs up but from feedback from others I decided to go for a mid-running pose. I’m not so comfortable with making up poses on paper, I can never seem to get the proportions right or the action looking strong enough. This is something I have been actively working on (mostly in Creative Research) in order to improve my animations. 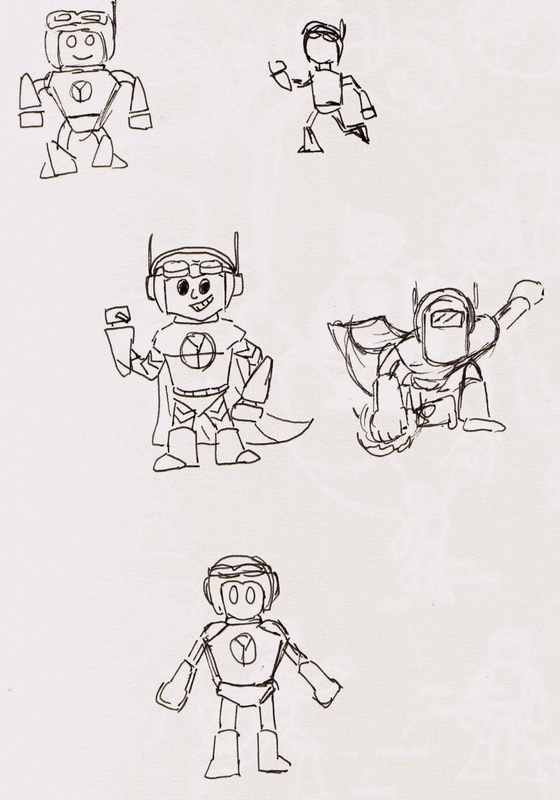 As you can see from the sketches there are some dodgy poses. When I brought this over to digital format I was able to correct things like the legs and get them looking more natural. I think this was done satisfactory but there’s always room for improvement. My typical 2D digital work often consists of Flash style drawings, mostly with thick lines and not much variation in them. I tried to go for a thinner line than usual which helped to make it a more crisp design but there’s still a long way to go. Something I’ve recently discovered is using a colour palette just for line work, where it takes a shade of colour from the object, darkens it and uses it for the line, rather than just black all the time. Although this is more of an illustrator based skill to practice, there’s no harm from exploring this further at some point. I include this skill evaluation mostly to do with the shading and shadows included in the final design. It’s actually the first time I’ve used shadows in a 2D cartoon drawing. I thought I managed to do this reasonably well for a first attempt. They just help to give the character depth and form as opposed to a flat image. If I were to improve upon this, I would tie the colours in to the line work to just improve the quality of the drawing overall.